The Gtronics Protoshield Plus works with a wide variety of ARDUINO / GENUINO boards: UNO, LEONARDO, YÚN, NANO, MICRO and MINI. Wired sockets for a servo connection, an external 7-9VDC power supply, and additional ICSP connector to use NANO and MICRO with standard shields, and additional holes let you to create shields with standard 2.54mm breadboards. 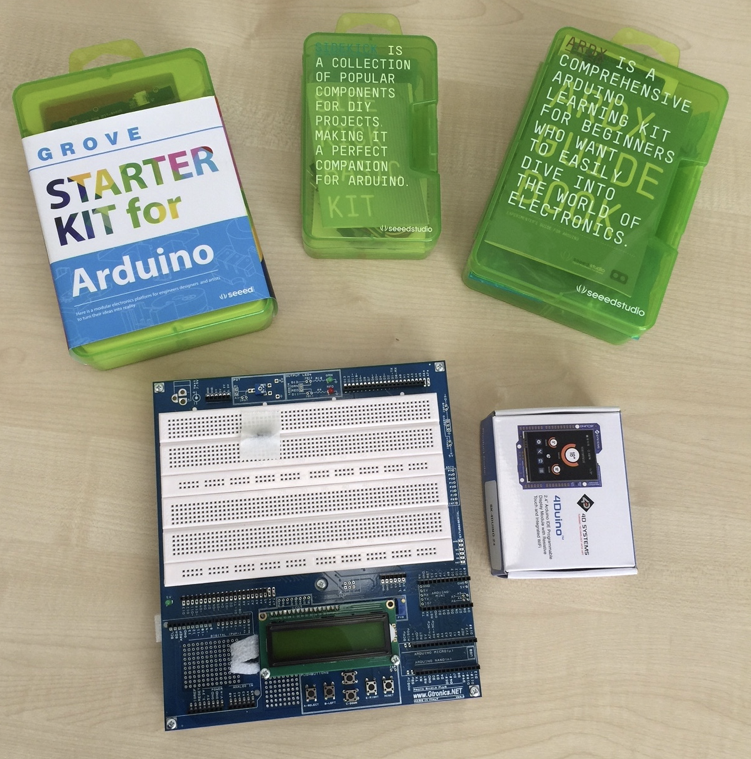 As well as the Gtronics Protoshield Plus, we have provided an ARDX Learning kit, Sidekick component kit, Seeed Grove Starter kit for Arduino and a 3.2” Gen4 intelligent display from 4D Systems - for each of the Biomaker 2017-2018 Starter Kits. For more details, see the Starter Kit page. In order to develop the 2018 tutorial sessions for the use of the XOD graphical programming environment, and control of Arduino-driven hardware - we have explored the use of multifunction shields to simplify the training session - to minimise fiddly and error-prone wiring during the sessions. The use of these shields can introduce clashes between their devices and elements on the Protoshield Plus. Details of the ports used by the Protoshield Plus and various multifunction shields are shown below. The Gtronics Protoshield Plus board provides a very flexible platform for prototyping new circuits. It includes a number of components that connect to digital and analogue ports on any Arduino board that is plugged into the Protoshield Plus. In order to use the Protoshield Plus with third party shields loaded with additional components, it can be necessary to unplug or rewire components to avoid post clashes. 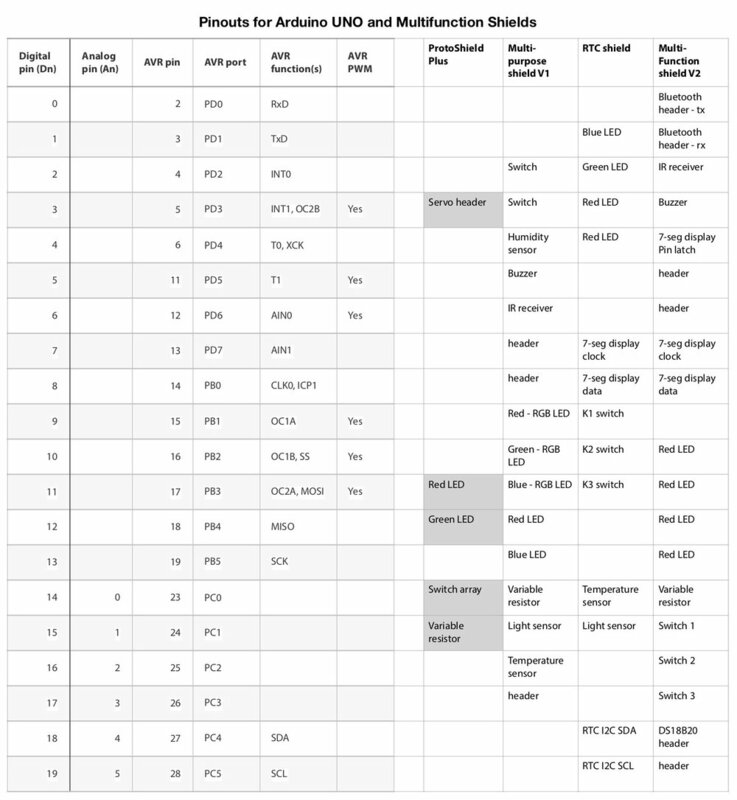 The table below shows the ports used on the Protoshield Plus - along with a comparison of ports used by a number of multifunction shields. 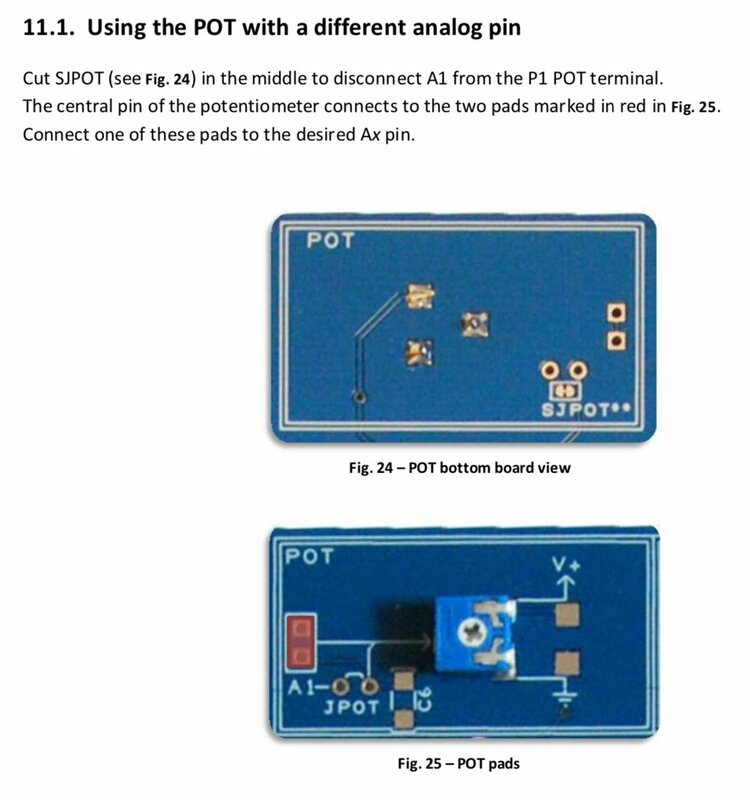 The Protoshield Plus manual is excellent, and provides the instructions for cutting traces to allow rewiring of port connections. We suggest disconnecting the push button array from port A0, disconnecting the green and red LEDs from ports D11 and D12, and disconnecting the potentiometer (variable resistor) from port A1. PCB pins can be soldered to pads next to the cut traces. This allows the components to be connected to new ports using leads with female-male connectors - to avoid clashes with operation of ports on attached shields. The default settings for the Protoshield Plus allow the use of the LCD display with an Arduino UNO compatible board as an I2C device on port 0x20 (decimal 32). The LCD display works well with the XOD/common-hardware node "text-lcd-16x2-i2c"